Bolt on rail pockets, drop rails into place and you're ready to go. Connect starters to adders to build longer sections of guard rail. Rail lengths are measured post center to center minus 1" (pocket spacing). Actual length is 5" greater than listed. 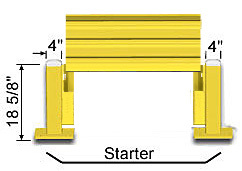 Starter Units consist of 2 posts, 1 guard rail, hardware, 2 lift-out pockets (right & left), and floor anchors. 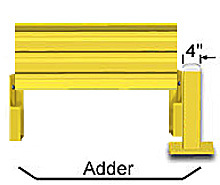 Adder Units consist of 1 post, 1 guard rail, hardware, 2 lift-out pockets (right & left), and floor anchors.